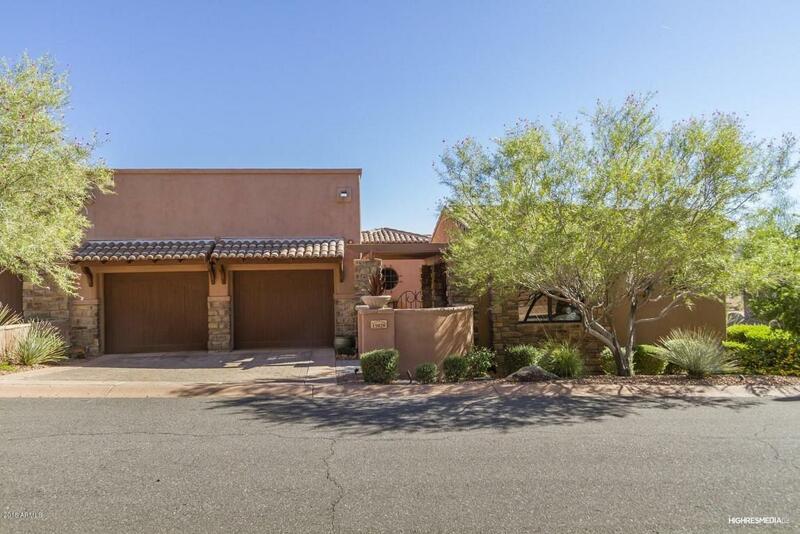 A refreshing splash of styles, this fine FireRock Country Club Villa is far from ordinary. This designer home is offered furnished & turn key (under bill of sale). The tranquil courtyard and prominent foyer provides a first impression of the bight and open floor-plan. Rich with inspiration, the Great Room provides a feel of extravagance with walls of glass spanning 16 feet, a stacked stone fireplace, hand-carved plank wood flooring, and boxed beam ceilings. Wrapping throughout the back of the home, the backyard patio allows for effortless entertaining with alfresco dining via the built-in BBQ grotto adjacent to a calming sheer descent fountain. The chef's kitchen was re-crafted with premium granite and Wolf appliances, including double ovens and built-in refrigerator. The convenientlaundry is spacious & handy. The walk-in pantry now features a workstation for convenient computing. Captivating emotions, the master is a true retreat featuring private access to the backyard patio, vaulted beamed ceilings, dual vanities, soaking tub with separate shower, and a custom walk in closet. Separate from the second master suite, pamper your guests in the private casita just off the courtyard. Hidden features of this home include a built-in speaker system, car lift providing extra garaged parking, custom paint tones, three HVAC systems, including natural gas heating. Designer turn key furnishings!!! One of the finest premium lots in the Villas at FireRock.